It is not widely known, but Marshall died on his way to play Bingo, wearing clean underwear. 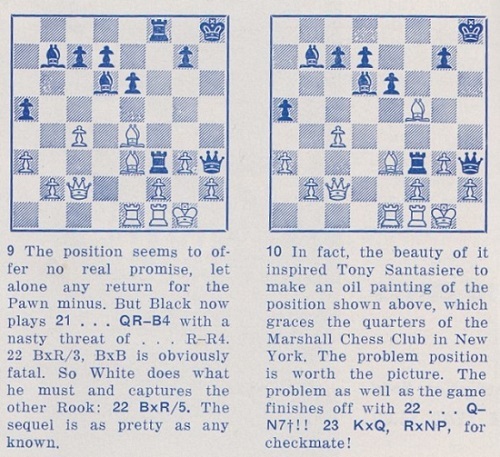 This is just one divulgation to be found in Essay on Chess by Anthony E. Santasiere (Dallas, 1972), a book that we have only just come across, and wish we hadn’t. It is, loosely speaking, a plea for tactical, rather than positional, chess (‘The Queen’s Gambit is neither a gambit nor an honor to any Queen. It is like a piece of dead flesh kept overlong on ice’) by a Believer who makes sure we know it. We have rarely read so many foolish judgements within such a short space. ‘Now Capablanca! the great Capablanca (how well he knew it! 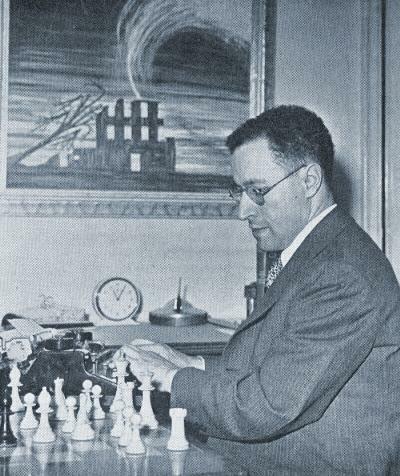 ), the perfect machine, the fiery temperment [sic] with, especially in his prime, the cold, selfish heart, the incredible insane conceit – Capablanca.’ (page 23). ‘Tarrasch was a egotist, a self-made Prussian God.’ ... ‘He was bankrupt spiritually.’ (page 23). After all that, the reader dreads what ‘punishment’ Alekhine will take, but the result is a surprise: the author likes Alekhine (despite his adherence to the Queen’s Gambit): ‘Spiritually, out of many sufferings bravely borne, he had patient endurance, humility, courage’ (page 26). Elsewhere we read of Chigorin’s ‘vanity’ and Herman Steiner’s ‘colossal egotism’ (page 31) and that Rossolimo ‘had been temporarily insane’ (page 43). 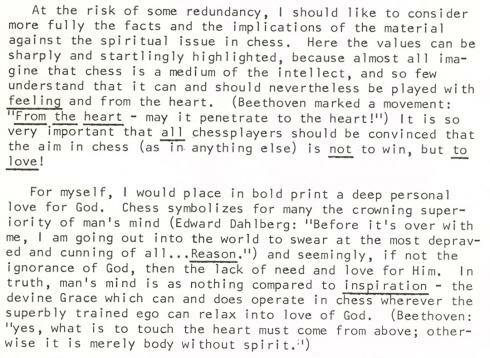 This is not an essay on chess, it is the prejudiced rambling of an apparently cultured man who, nevertheless, was gravely deficient in common sense. Once the sub-Fine psychology peters out, our author descends to the usual old chess anecdotes, a minimum effort being made to string them together in any logical order. It is a wretched book. Anthony Edward Santasiere was born on 9 December 1904 and died in Hollywood, Florida on 13 January 1977 (although his death was not widely publicized). For unclear reasons, similar verse appeared, with no mention of Marshall, on page 6 of Santasiere’s posthumous book My Love Affair With Tchigorin (Dallas, 1995). C.N. 2967 discussed the poetry of Santasiere, quoting a clemently brief sample. It may be added that page 3 of his book Essay on Chess stated that among his output ‘there are three volumes of poetry; one of essays’. On page 160 of the March 1977 Chess Life & Review Santasiere’s obituary contained the assertion ‘at least three volumes of verse’. Have any readers seen them? Corroboration of these statements is sought. 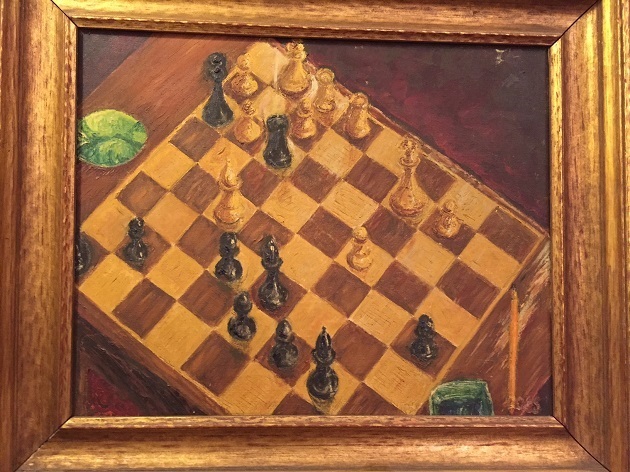 Concerning the painting by Santasiere depicting the game in question, A Brilliancy by Hermann Helms, Ronald Young (Bronx, NY, USA) reports that he saw the picture hanging in the Marshall Chess Club in 2003 and noted that the position reproduced was not precise. He asks whether a photograph can be obtained. Latest update: 28 February 2015.